Maybe most of you have already had your fill of Chelsea - well you certainly will have, if you have watched all the extensive and effusive TV coverage! Anyway, I'm sure you'll want to read my account, without a single bigotted opinion - except mine! This is of course a big event any year but particularly so this year, as it is the centenary of the Chelsea Flower Show. 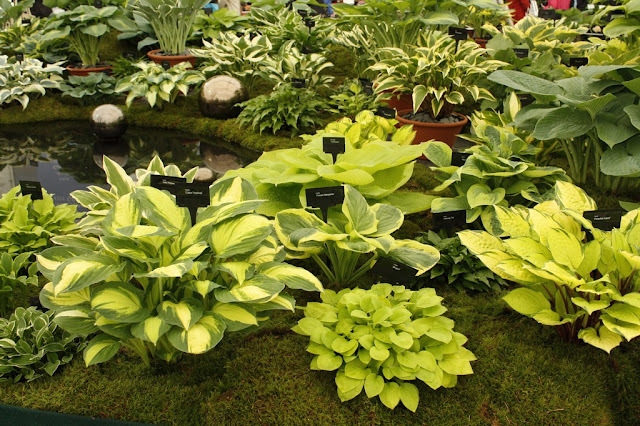 A few were missed because of the war years but otherwise its been running for the last century - such is the popularity of plants and gardens. I won't delve more into the history as its been well documented and publicised. 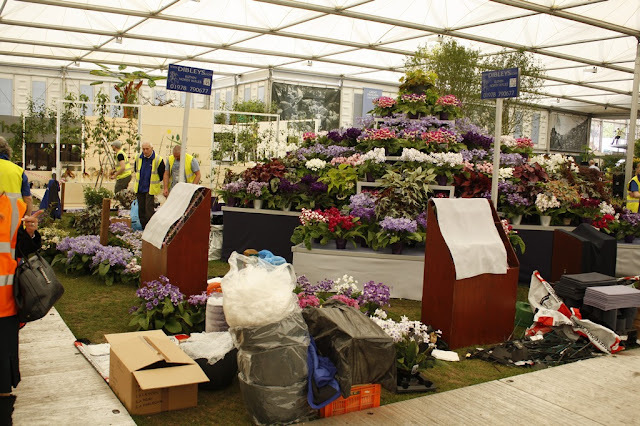 Seeing the site on the Sunday afternoon, it always looks as if its going to be a long night to get ready for Monday morning judging! No gardener will be unaware of what a tough late winter and spring it has been. 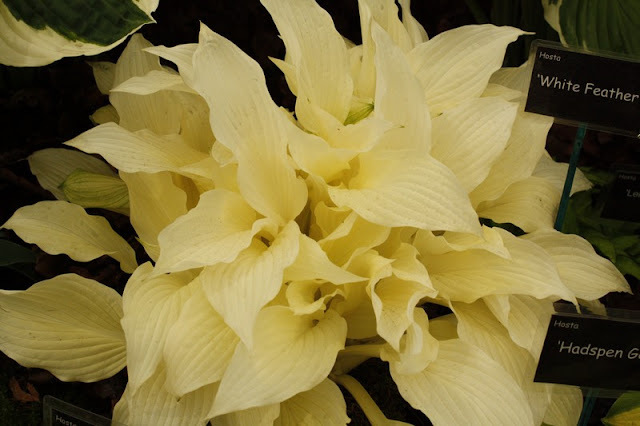 And this has undoubtedly had an effect on the maturity of plants in many displays and the amount of colour that they were showing. Amongst the exhibits that I judged, there were a few major disappointments, with plants not being ready. 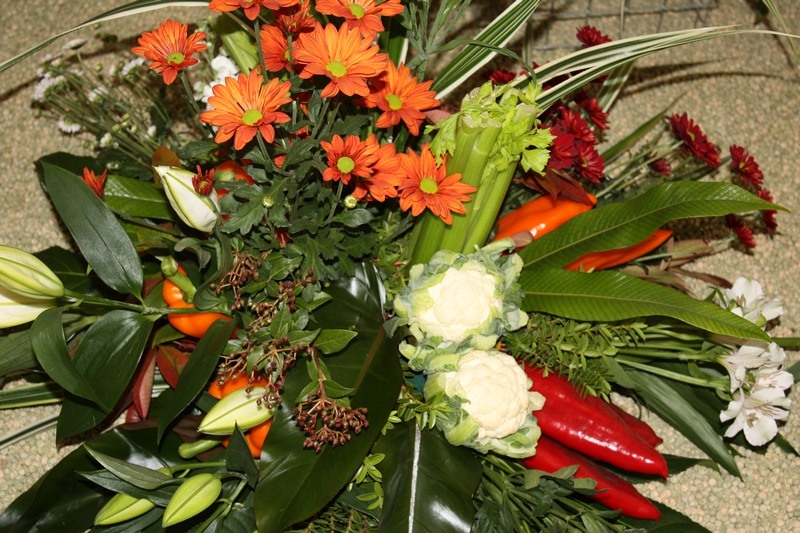 However disappointing this may be for the exhibitors, the judges can only take into account the exhibit before them. At the formal dinner on Monday, the President announced, as had so many Presidents before her, that this 'Chelsea would be the best ever'. 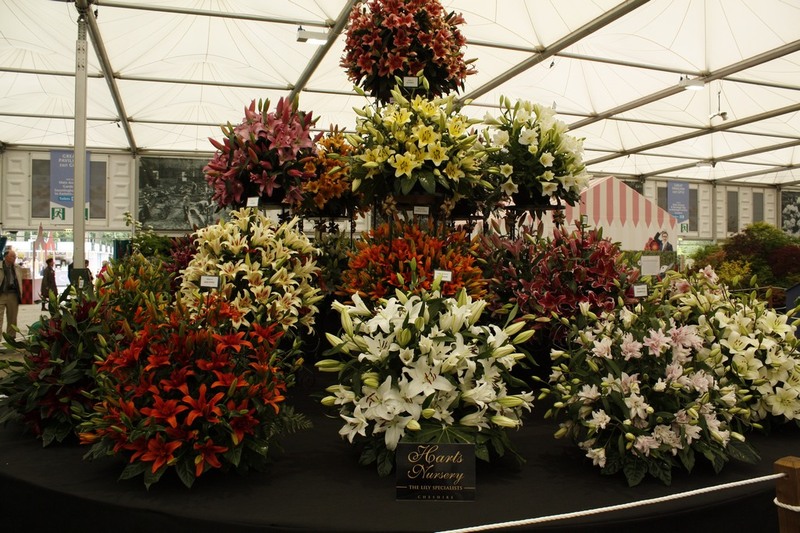 Whilst the centenary show undoubtedly has many highlights, from the aspect of plant quality this superlative is a little optimistic! 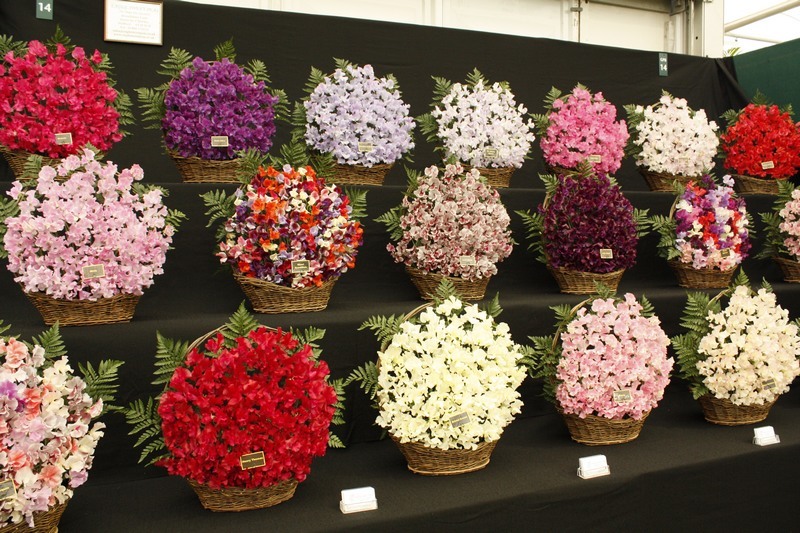 Bearing in mind how cold it was when judging at 8am last Monday, I am amazed that we judges were in a generous mood but from amongst 103 exhibits in the Floral Pavilion, we awarded 62 gold medals. 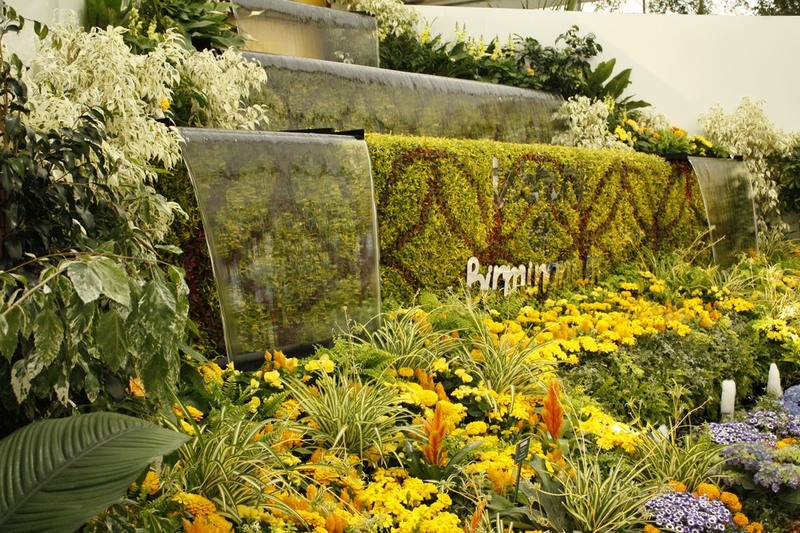 In order to achieve this standard, the exhibits and the plants within have to be almost perfect, so it is indeed an award well worth achieving. 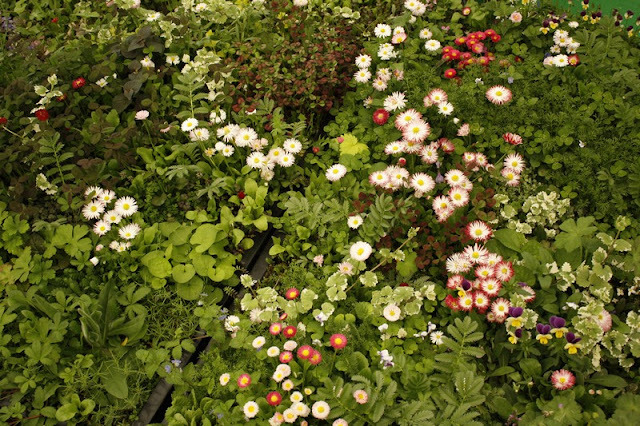 How can one possibly highlight the best from amongst such a wealth of plants? 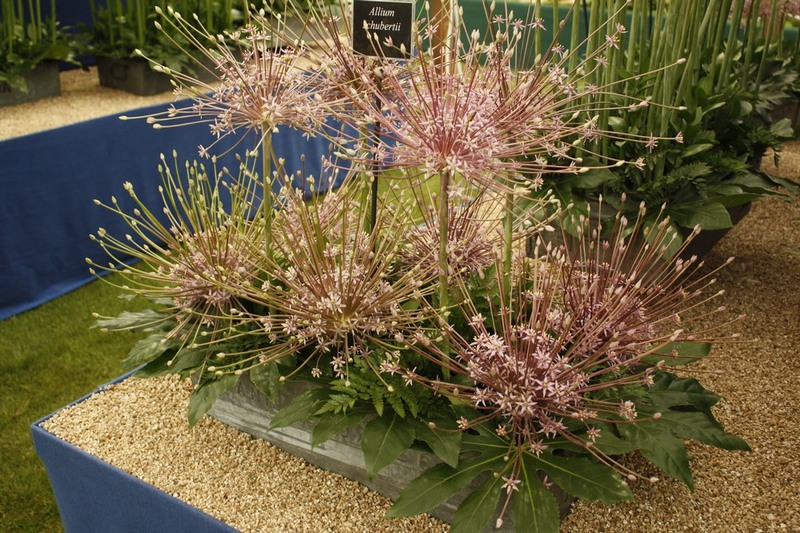 The Diamond Jubilee Award, sort of best in show for the nurseries, went to Warmenhoven who had brought an exhibit of Amaryllis and Allium all way from the Netherlands, as they have done for so many recent shows. 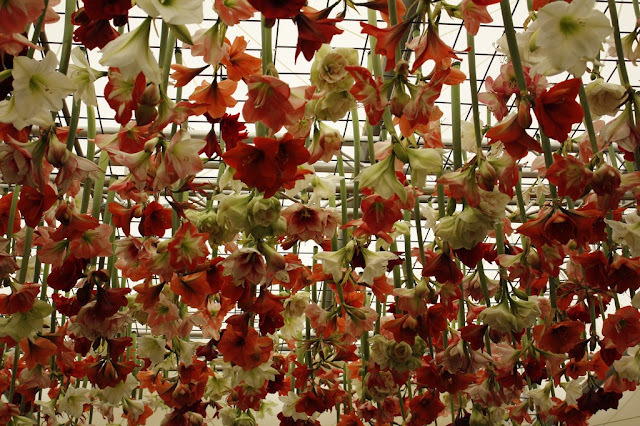 Not only was the plant quality exceptional but the display was amazingly creative, with some 30 different cultivars of Amaryllis hanging from a gantry above our heads. 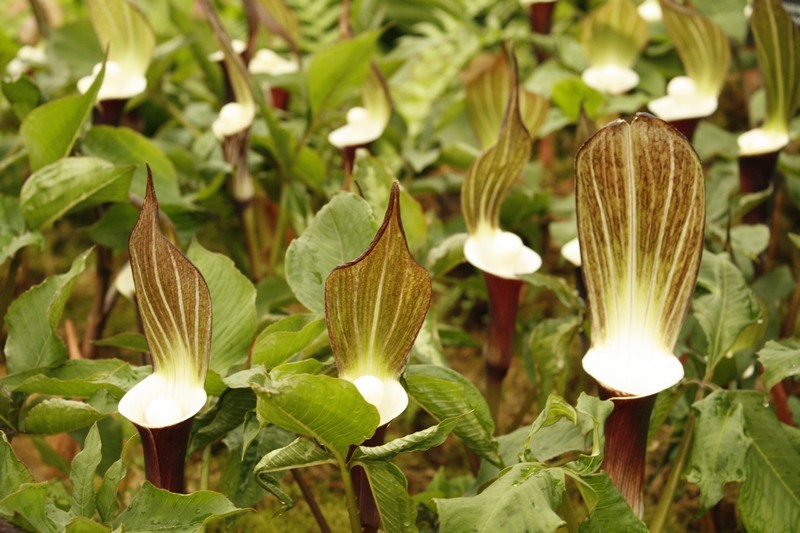 Beneath this on four separate islands were geometric arrangements of Allium and some Ornithogalum. I had the privilege to be involved in judging this exhibit and was thrilled to know that our recommendation for this top award had been confirmed. A 'Sistine Chapel' of flowers! 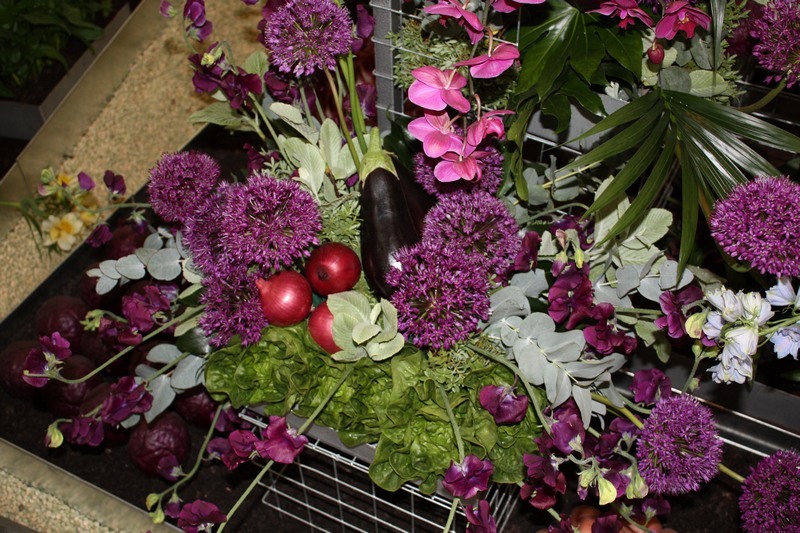 The National Farmers Union stand, showing the best of British produce; fruit, vegetables and flowers, was once again spectacular, not only in the quality of goods displayed but in the innovative way in which they were arranged. Sadly it is rumoured that this may be the last year they will be exhibiting. Allium flowers heads with - yes red onions! 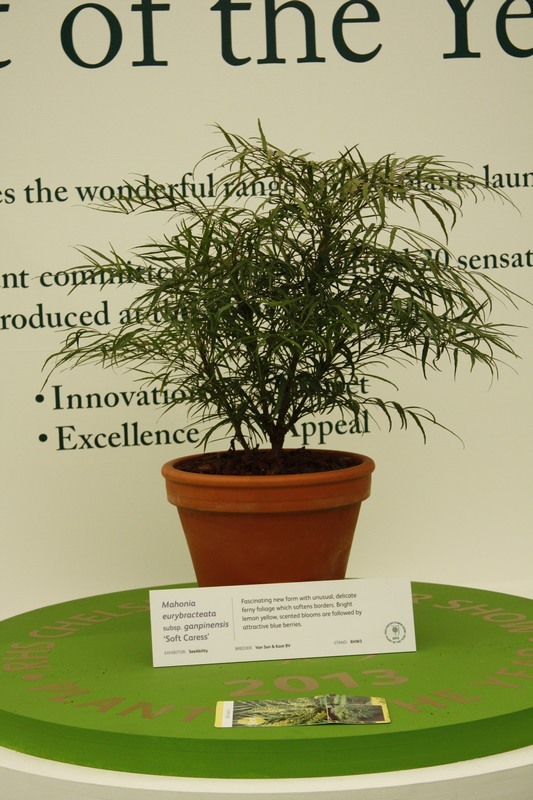 In the science area, there was a curious stand from the University of Reading, demonstrating grass-free lawns, composed of various flowering and foliage plants. 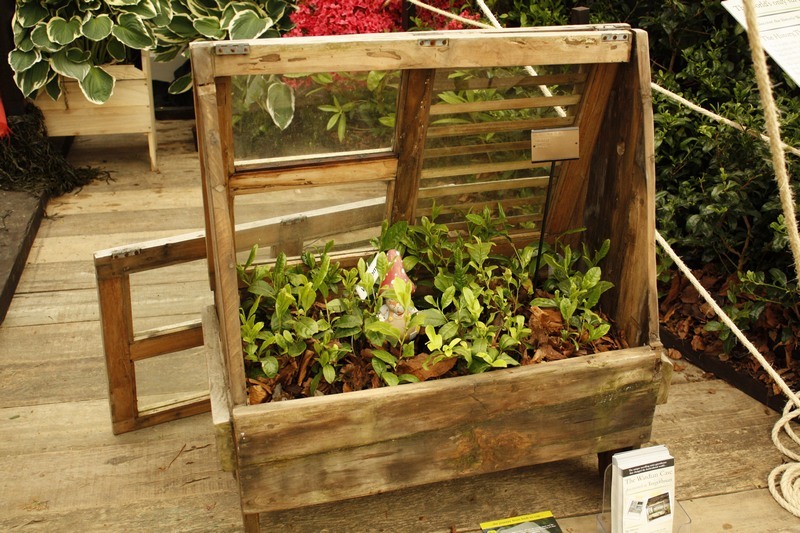 Although the display boxes at the show looked interesting, I have to admit to a certain amount of scepticism about the sustainability of this in a practical situation. Nearby there was a exhibit from Tregothnan Gardens, featuring a unique and original Wardian case that had been discovered locked away in a garden shed. This simple device was key to the successful transport of so many plants across the seas and back to the UK in the 19th century. 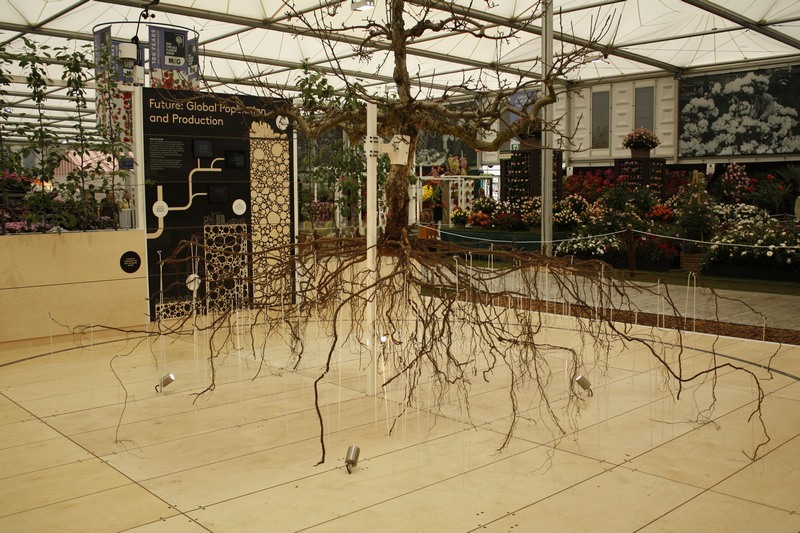 East Malling Research Station had an exhibit related to fruit trees and rootstocks, the centre of which was a mature apple tree with its entire root system washed free of soil. 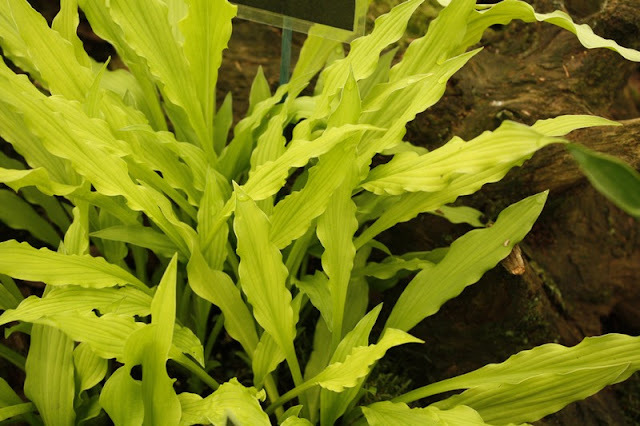 It is amazing to see how far this hidden part of a plant extends. No-grass lawn from Reading Uni? 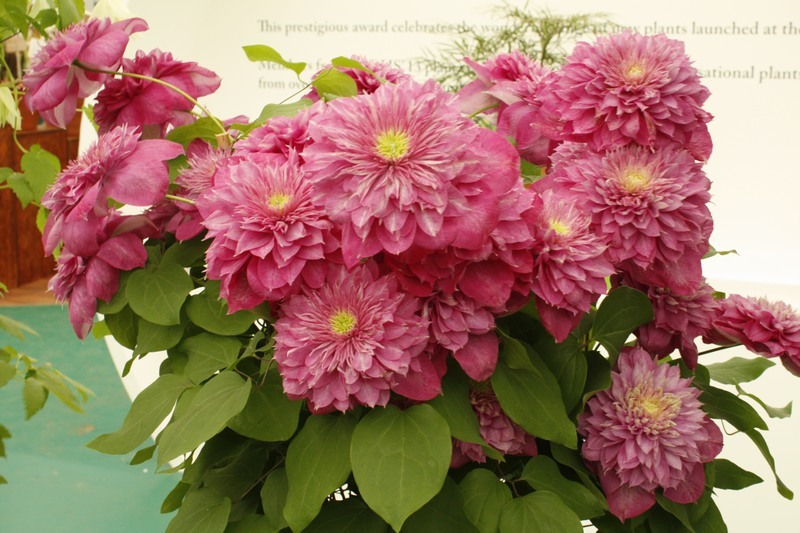 Three particular nurseries were noteworthy in that they had been present at the first Chelsea flower show, 100 years ago and are still exhibiting today. 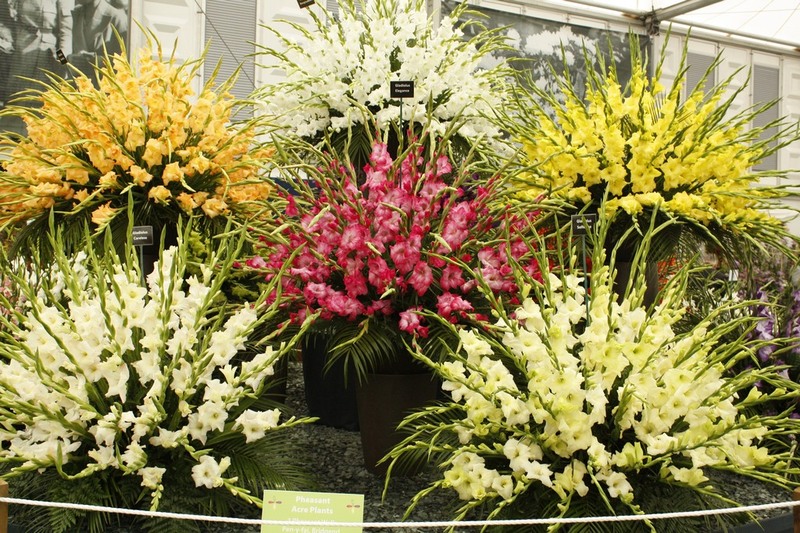 McBean's orchids received a gold medal but regrettably Kelway's only achieved a silver gilt for the iris and peonies and Blackmore Langdon got a silver for their delphiniums and begonias. No doubt both exhibitors, victims of the very bad growing season, were disappointed. 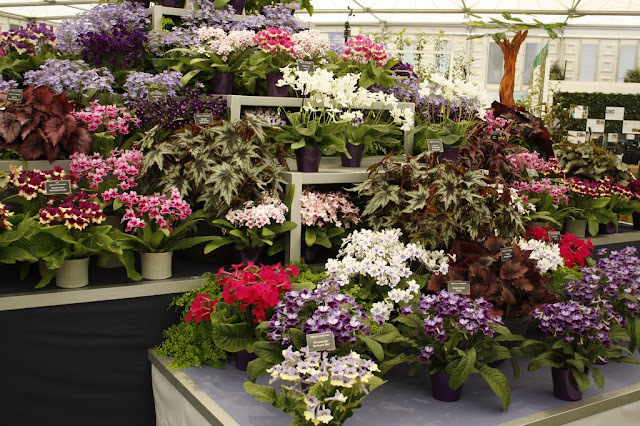 As well as the many inventive and well-designed stands at Chelsea, there are a few unrepentant traditionalists. If such nurseries had chosen to display their plants in this way to celebrate the centenary, this would have been entirely appropriate. Sadly in some places the displays are the same as they have been for many years, show after show, after show! 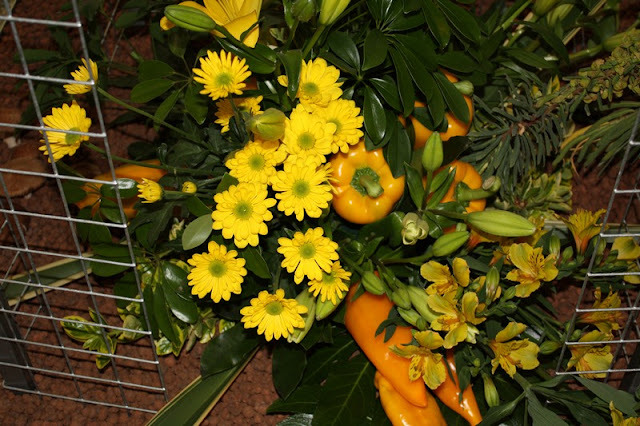 Whilst florists and flower arranger's consistently dream up an exciting new ways to use cut flowers it is disappointing to see such flowers as sweet peas, alstroemeria, daffodils and chrysanthemums forced into vases to make tight blobs of colour. So much missed potential. 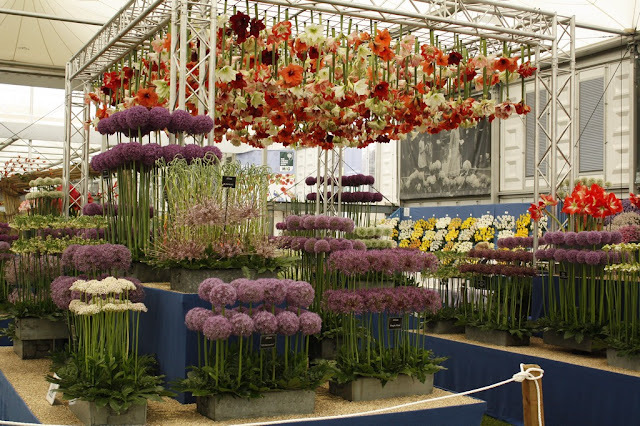 Imagine all these beautiful blooms arranged by the Warmehoven or NFU team - could be a WOW! 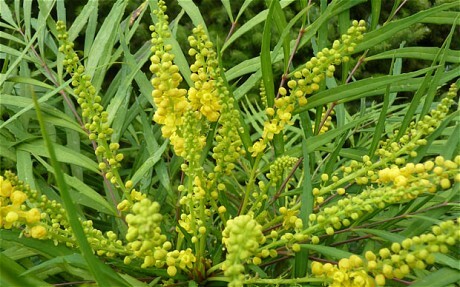 Once again, the RHS hosted a plant of the year competition which this year was won by a Mahonia called 'Soft Caress' (full name Mahonia eurybracteata subsp ganpinensis 'Soft Caress' - got it?) 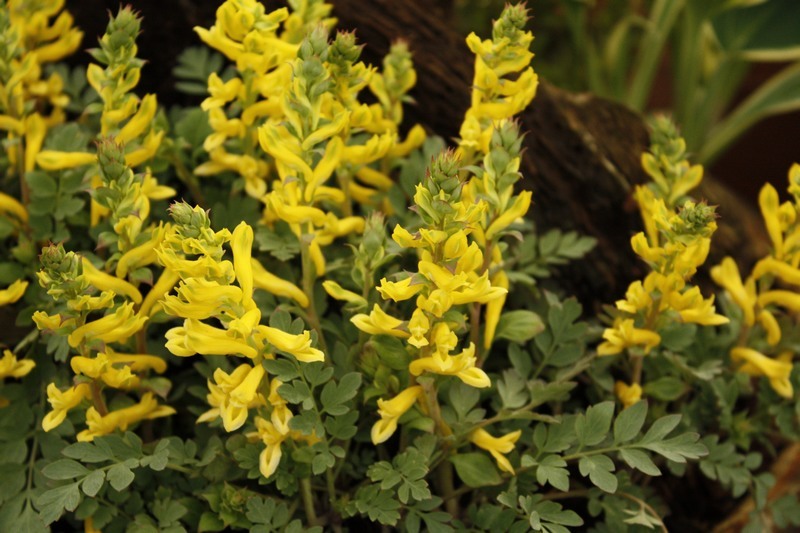 which has delicate, prickle-free leaves and yellow flowers in late summer. 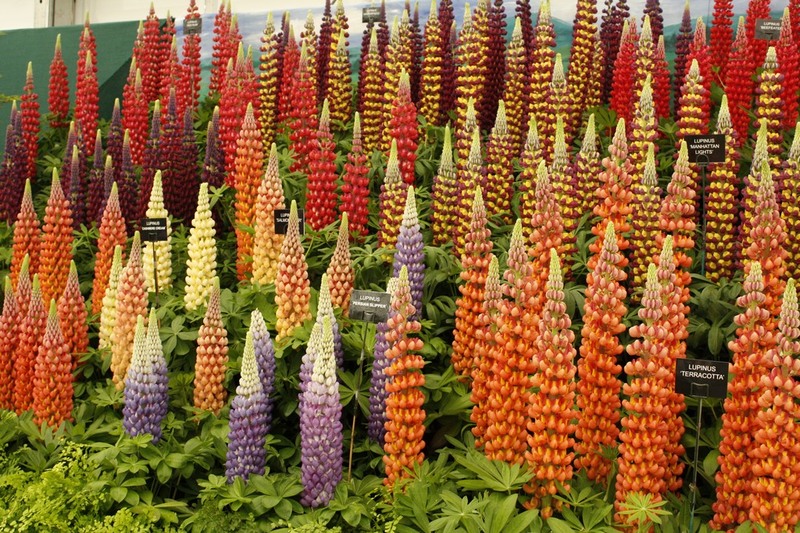 Alongside this was a competition for the plants of the century, with 10 contenders, one for each decade. 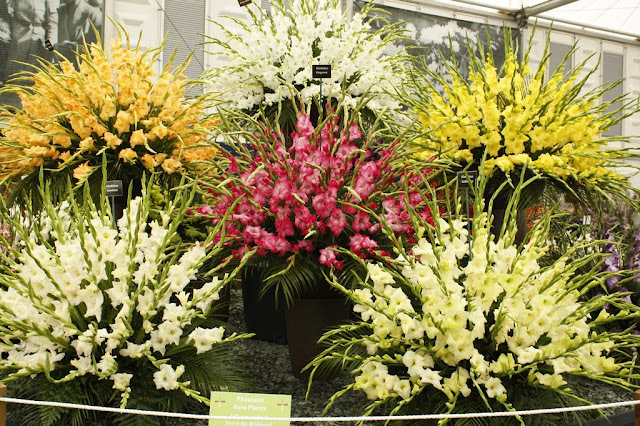 This one will be decided by public vote and announced at the end of the show. Diascia 'Sundiascia Rose Pink' - another hopeful - I like this one! 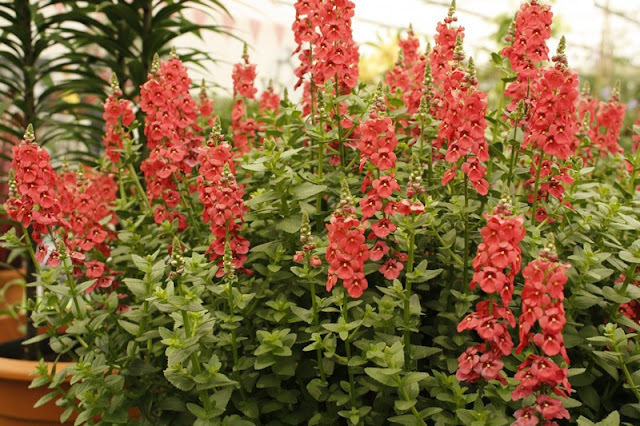 Finally just a selection of plants that particularly caught my attention, mostly for their vibrant colours - all very subjective! Apologies if the pictures aren't particularly good quality but I don't think the sun shone at any point during my visit earlier this week and so the light levels in the Floral Pavilion were poor. 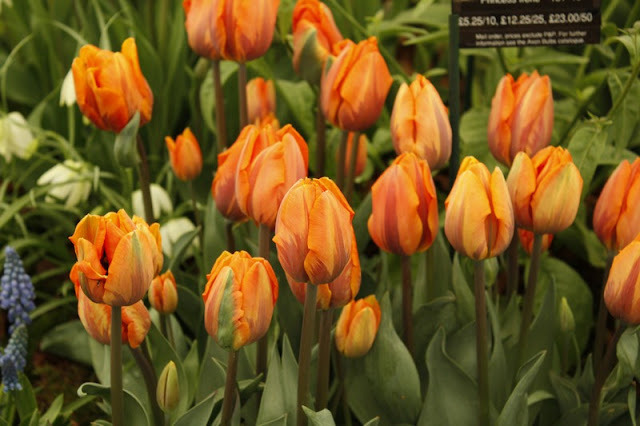 Tulip - 'Princess Irene' - not new but love it! 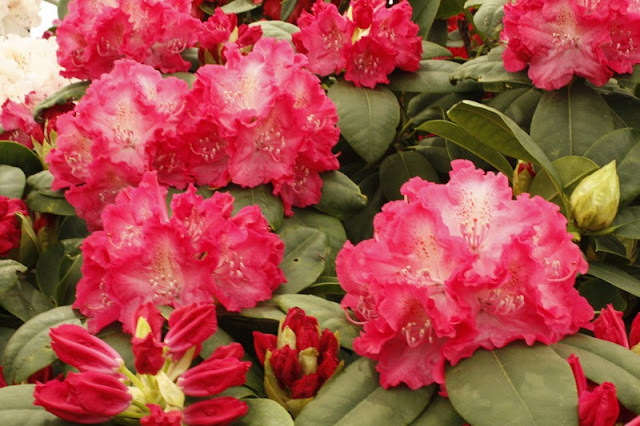 Rhododendron 'Germania' - I don't really like rhodo's but just get a hit of this for colour! 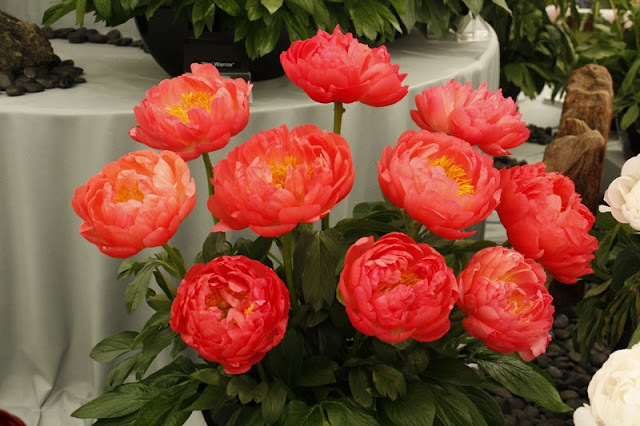 Paeonia 'Coral Sunset' - again - such an intensity of colour! 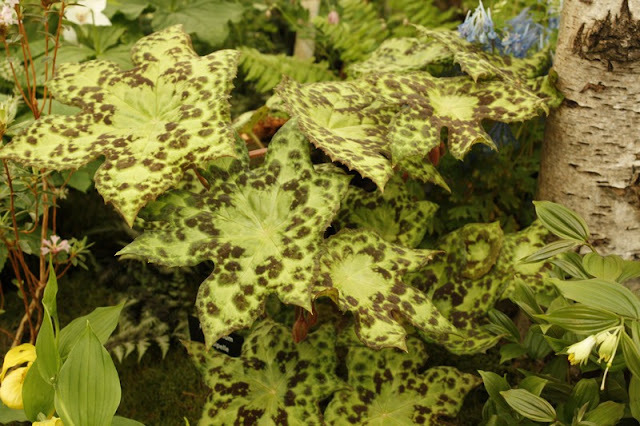 Podophyllum 'Spotty Dotty' - must get this! 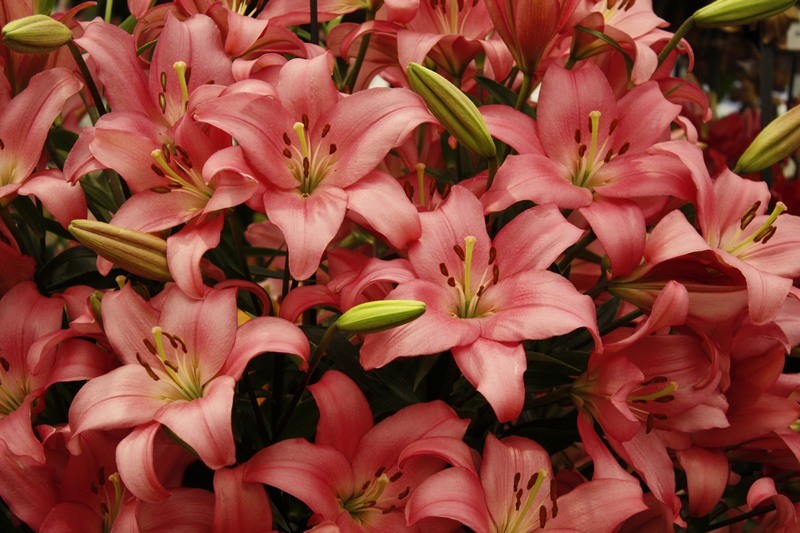 Well - its been a cold spring and it was a cold Chelsea - I nearly froze judging on the Monday! Next post, I'll tell you about the gardens, if you are not totally fed up with Chelsea! Those lupins are so perfect it is almost frightening. 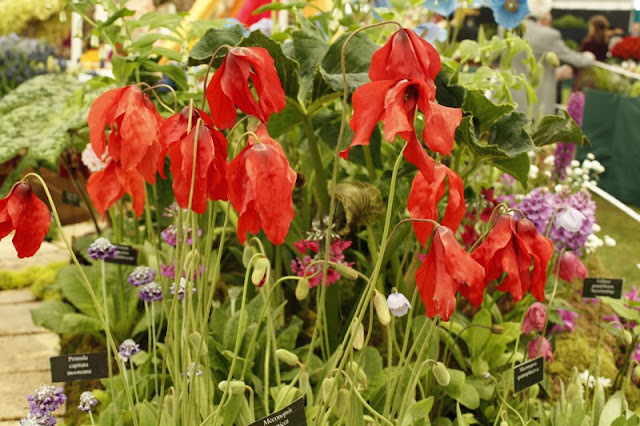 The Meconopsis punicea is really lovely, making me wish once again that the members of that genus could take a bit more heat. You were busy judging when we caught sight of you so opted not to disturb. Nice to hear some insight from one of the judges. 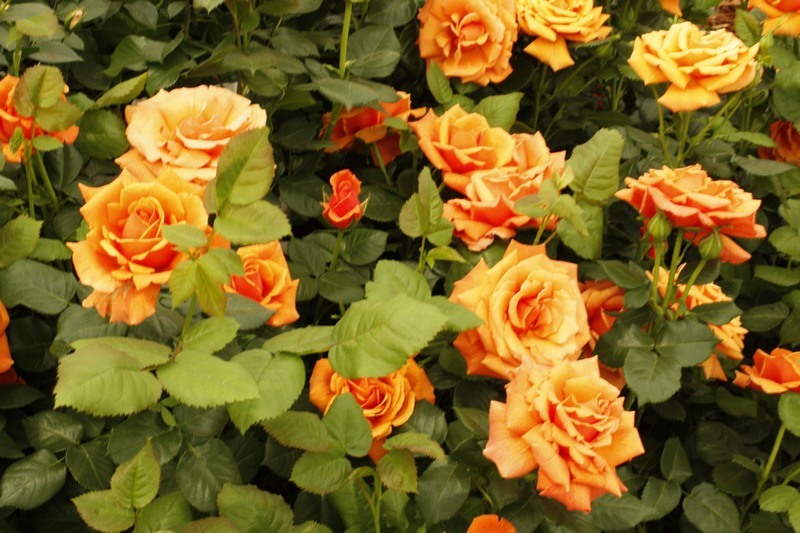 Chelsea - what else - the gardens! Chelsea - here I come!